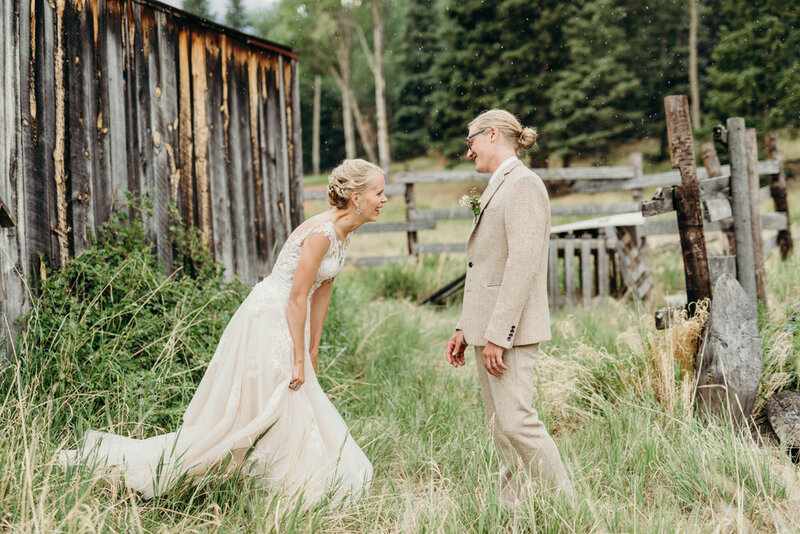 My favorite part about my dress wasn’t discovered until Jared and I were walking through the meadow for our “first look”. The many layers of mesh that made up the skirt had collected hundreds of tiny moths as I walked through the grasses. The dress had become my very own butterfly house. My sisters were quite concerned that I was walking around with bugs in my dress, but I was thrilled. An unintended but welcomed effort to incorporate this special place into our special day. We had each of our guests take a quartz rock, which we’d collected the week prior while hiking with family and friends. It’s an extremely common mineral here, but one we still enjoy treasure hunting for during long hikes in the woods. After Jared and I read our vows, each guest was asked to come up and place their quartz within a circle that represented our love for each other. For me, this was hugely symbolic. Each of the people who attended our wedding had in some way shaped or supported Jared and I at various points in our relationship. The support I felt from all of our loved ones over Jared’s and my many years together all seemed to culminate in this moment. On top of contributing their stone, our guests came up to us individually and offered there well wishes. There little pieces of advice, or anecdotes, or compliments were so heartwarming, and something I’ll never forget.